Really beautiful photograph! Congratulations on winning the open wings photo challenge well deserved! Brilliant! Congratulations on a well-deserved Challenge Win. Congratulations. superb capture of open wings. Love the colours in this photo, the pink of the bird against the grey sky is lovely! Thank you all for your comments ..greatly appreciated! 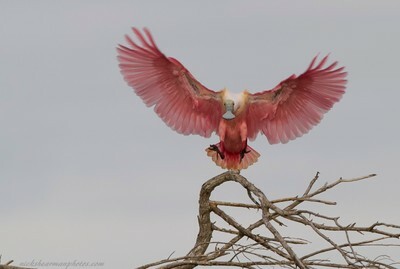 Roseate Spoonbill coming to land on a branch .Everglades National Park ,Florida .